What I can say, still a new new thing to do if you are working with a serious project, think it twice. It had given me some interesting challenge. Spring, aspectj, and Hibernate, the domain object are injected with the repository. Some how, domain driven design made me think that Eric Even's "Entity" are similar to EJB's "Entity" bean. They are all heavy objects. They all hide the details about the database operations. They all need this factory and service to complete the life cycle. Let me know if I am wrong about this. 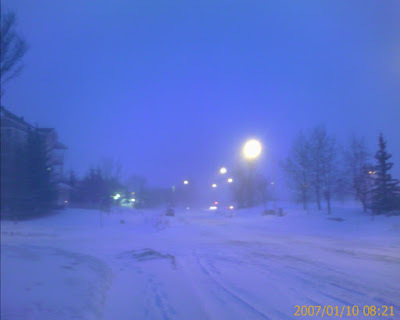 Here was what Edmonton just had on Jan 10, 2007. I was looking at Maven2 and am very convinced by its power. To have a project going, maven 2 can save you a lot of time on those small things. Testing report, build, dependency jar files and more. The Continuous Integration tool I used is continuum. A very nice tool, it works with Maven nicely. Another thing that is worth to mention is that JSF is not that bad after all. I spent a little time on JSF and found it's not hard to pick-up. It is going to win a bigger market share soon. Because it's "standard". A lot people will buy it just because of that.